Are you ready for the BEC exam? The BEC (Business English Certificate) exam is made up of three different levels. The BEC Preliminary, BEC Vantage and BEC Higher exams. In order to successfully pass all the levels a student must be well versed in general and business English. The certificates are very prestigious but also very difficult to obtain. Are you ready to take the BEC exam? Are you able to pick out incorrect or unnecessary words out of sentences? Do you have the ability to write business documents on any business topic? Can you understand a business monologue such as on a T.V. news show? Do you know how to pick up attitude and feeling from English text? Can you hold a business related conversation without having to pause? Are you able to give and have a complete business interview in English? Can you easily read and understand business texts such as emails, economic newspapers or trade magazines? If you answered 'no' to any of those questions, you may want to speak with one of Live Lingua's BEC tutors. The first trial BEC class is absolutely free. You can speak with the tutor to see if they think you are ready for the BEC test and they can propose a study plan for you. No credit card required, and no commitment. 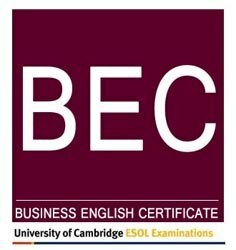 The BEC (Business English Certificate) Preliminary exam is the first test that most candidates take on their journey to complete the BEC exams. It is meant for students who have an intermediate level of business English. Even though it is the first of the BEC exams, the BEC Preliminary test should not be underestimated, and should be prepared for seriously. It tests how well a person is able to use business English in the work place and in the international business world. It consists of the following sections. Do you have any questions about the BEC (Business English Certificate) Preliminary exam? You can speak to one of our BEC tutors for free to ask any question you may have. They will speak with you and evaluate how prepared you are. The BEC (Business English Certificate) Vantage exam is the second test that most candidates take. It is meant for students who have an intermediate level of business English. This level of the exam requires a notable improvement in the candidates’ business English level when compared to the level necessary for the BEC Preliminary test. If you had trouble on the BEC Preliminary test or barely passed it is recommended that you study for at least 6 months before trying the BEC Vantage exam. It consists of the following sections. Do you have any questions about the written BEC Vantage exam? You can speak to one of our BEC tutors for free to ask any question you may have. They will speak with you and evaluate how prepared you are. The BEC (Business English Certificate) Higher exam is the final step in the BEC exam ladder. This test should only be attempted by people with a very high level of business English. If you have any difficulty in any areas of business interaction in English you should not yet attempt to take this test. Candidates who take this test want to prove that they are able to speak, listen, read, and write in almost any business environment around the world. The BEC Higher exam is made up of the following sections. Do you have any questions about the written BEC Higher exam? You can speak to one of our BEC tutors for free to ask any question you may have. They will speak with you and evaluate how prepared you are. Speak To A BEC Tutor Today! What makes Live Lingua BEC tutoring different from the local tutors or enrolling at a local language school? And best of all, we let you meet and speak to your future BEC teacher before having to commit to paid classes! The more BEC lessons you enroll in at the same time, the cheaper the hour of class gets. Still not sure if Live Lingua BEC tutoring is the right choice for you? Then just try a free lesson with one of our tutors to make sure. No risk, no commitment. Take a 60 minute trial Skype English lessons with one of our Skype English teachers. No credit card required. "I had not been able to find a job in over a year due to the bad economy here in Spain. I had just graduated from school, with no experience and nobody wanted to give me a chance. So I decided to learn English to make myself stand apart from my other classmates. I spent 1 year with [my English teacher]. He was great, since he speaks Spanish, and when we started I spoke almost no English. Now look at me, I speak English at an advances level, just got my CPE certificate, and just started a new job. Thank you all so much!" "For anybody with a strange work schedule I recommend Live Lingua. I can take classes at any time no matter where in the world I am. There is no other service like this." "I could never have gotten my BEC without the help of [my English teacher]." "[My English teacher] is awesome!"